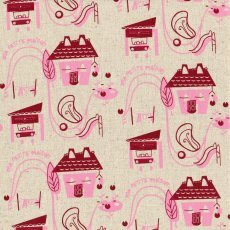 With a touch of whimsy and a dose of bright retro we are pleased as punch to release and co-produce Tara Davy's first range of hand screen printed textiles 'exclusive' to Kelani Fabric. After years of designing and illustrating for the magazine industry, Tara is thrilled to apply her work to a new surface. In two light-hearted designs, 'Partridge' and 'Hot Air', get creative with 100% linen at home. Then whip up some children's clothing with 100% certified organic Australian made jersey. Or skip the sewing and have a cushion or lampshade custom made through our online service. Whatever the project, the result with these beautiful hand screen printed, designer fabrics is sure to impress!